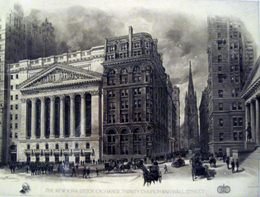 The New York Stock Exchange (NYSE) has a Wall Street address, 11, based on the narrow entrance that leads to the main building that faces Broad Street. 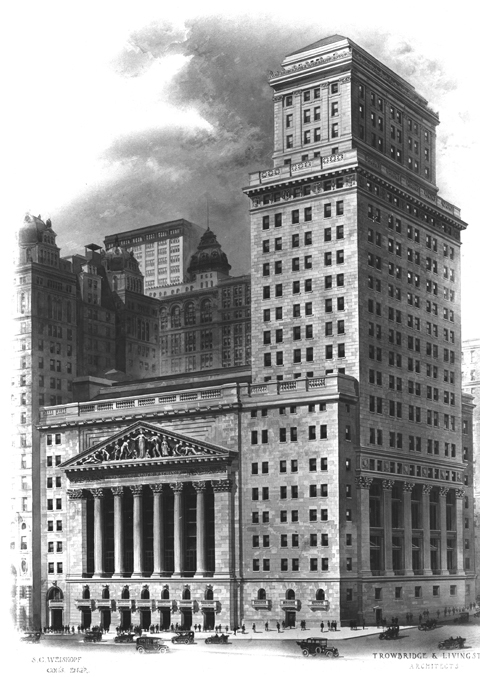 That imposing neo-classical temple with white marble columns and pediment of the NYSE was designed by architect George B. Post and completed in 1903, replacing the first home of the Exchange constructed on that site in 1865. 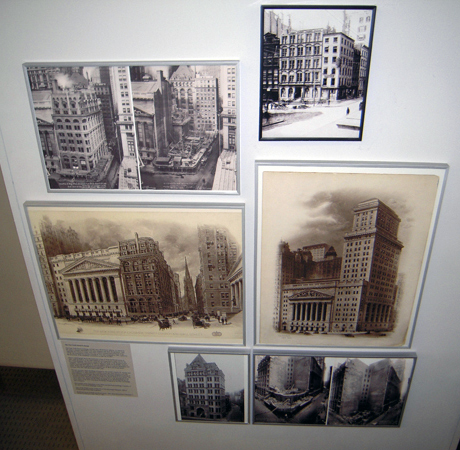 Print of the NYSE Annex, Collection of The Skyscraper Museum. Gift of Weiskopf and Pickworth, Engineers. Southwest corner of Wall and Broad streets, 1885. Reproduced from Valentines's Manual of Old New York, 1922, p. 185. 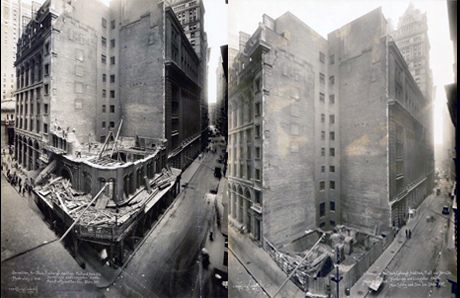 Photographs of the demolition of the Wilks and Mortimer buildings. Courtesy of the New York Stock Exchange Archive. Below, a photograph shows the southwest corner of Wall and Broad streets in 1885, with demolition of the older buildings just beginning to make way for the new Wilks Building. 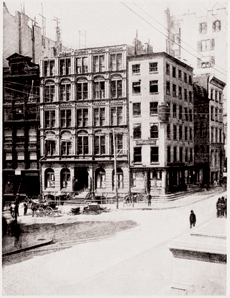 The narrow corner lot, the first home of the Western Union Company, had been purchased in 1882 by Matthew Wilks for $168,000, which at slightly more than $330 per sq. ft. was the highest price yet paid for Manhattan real estate. Wilks had also purchased five smaller lots on Wall and Broad streets between 1876 and 1884 for a total of $891,000. Reproduced from Valentines's Manual of Old New York, 1922, p. 185. 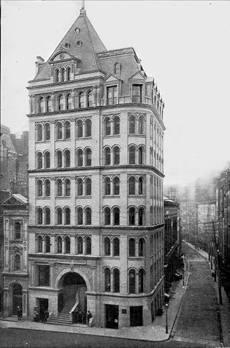 The new ten-story Wilks Building, designed by the prolific Charles W. Clinton and was completed in 1890, featured a rounded corner and steep mansard roof with three chimneys. It joined the nine-story Mortimer Building, designed by George B. Post and completed in 1885, to fill the block from Broad Street to New Street. 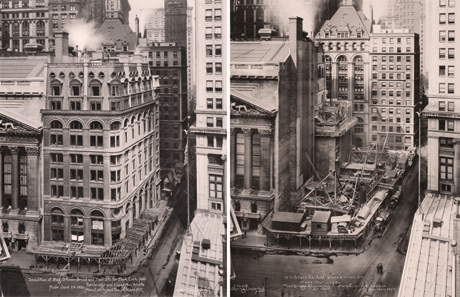 The demolition of the Mortimer Building in 1919 is shown in the photographs at the lower right when, along with the Wilks Building, it was demolished for the 23-story Annex of the New York Stock Exchange, designed by the firm Trowbridge and Livingston.